The weather today was Fortuna usual: cold and foggy in the morning with the hope of sun in the afternoon. 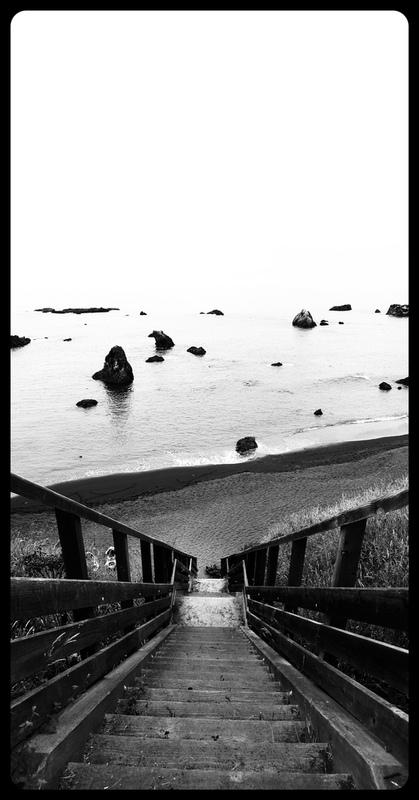 Looking a the map, there are a a few main options into Garberville: The Lost Coast, Avenue of the Giants with Shelter Cove, and Alderpoint Road. I’d done the other two in years past, so I figured I’d try Alderpoint. Alderpoint Road intersects with highway 36 in Bridgeville. 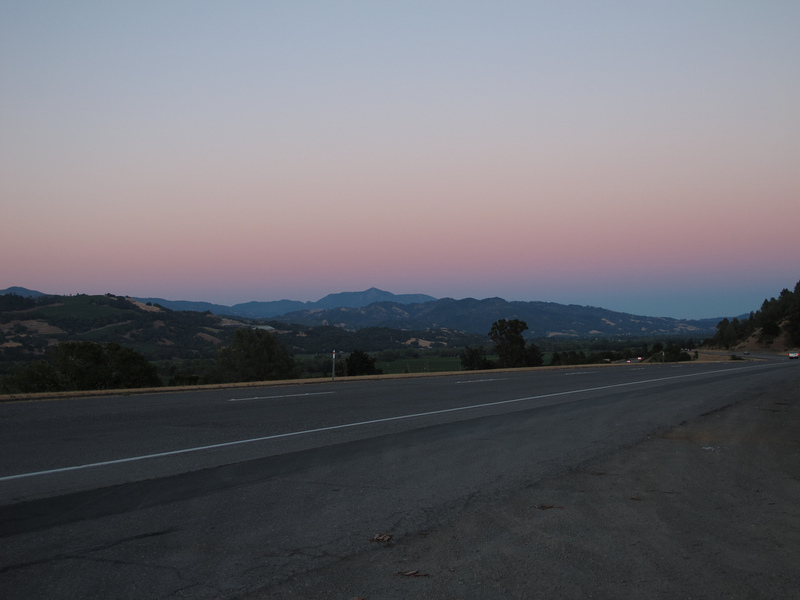 Highway 36 is always a great ride. 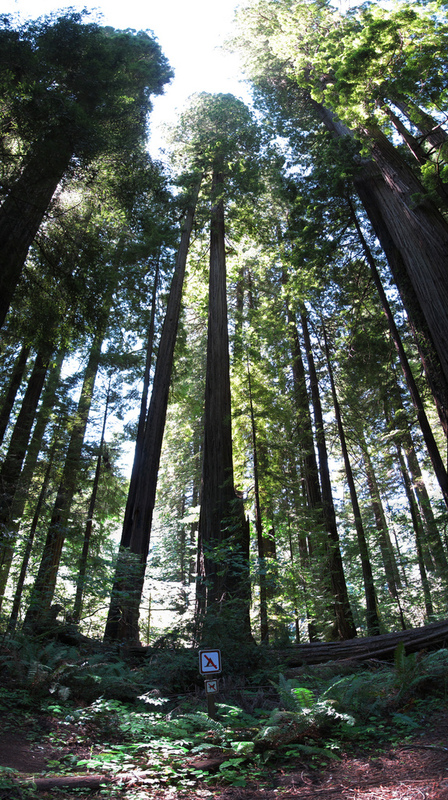 The first part of it has a nice section through the redwoods and then starts to climb into the Trinity Alps. The trees are equally as beautiful. The amount of greenery in this section of California is un paralelled. 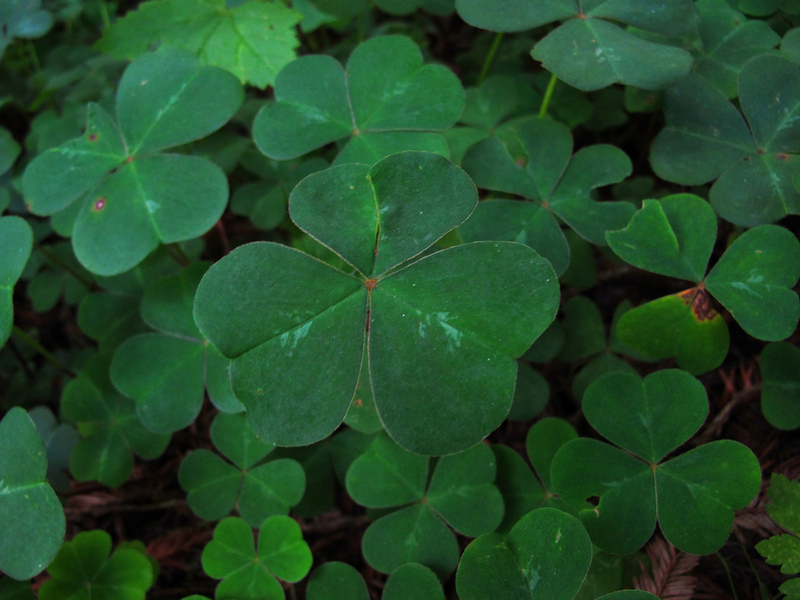 I found a nice grove of clover in the area. 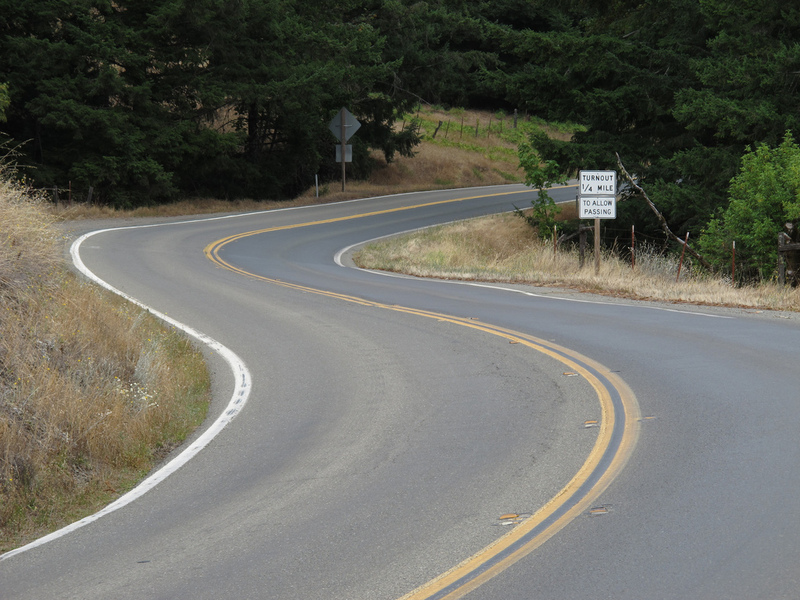 The Alderpoint Road turnoff is west of the big mountains along CA-36. 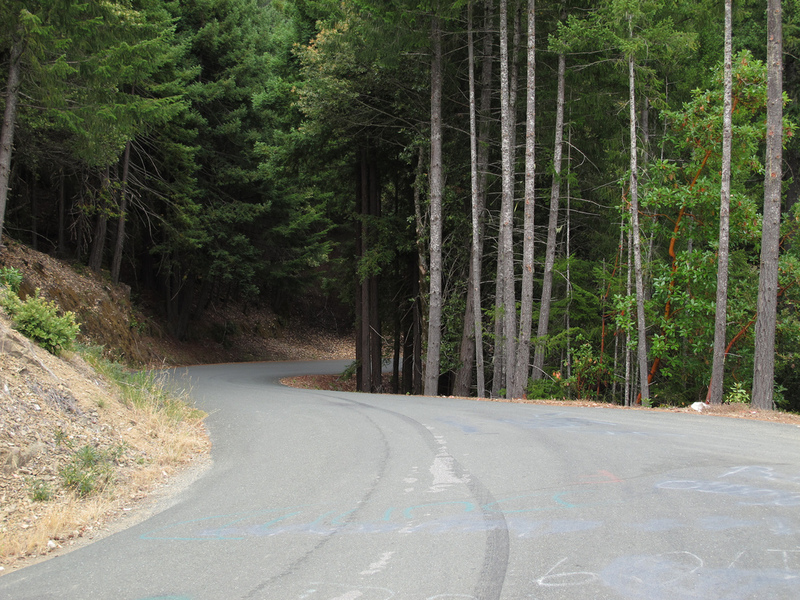 Thus 36 has some nice squiggles amongst the redwoods, but this section pales in comparison to the Trinity Alps section. 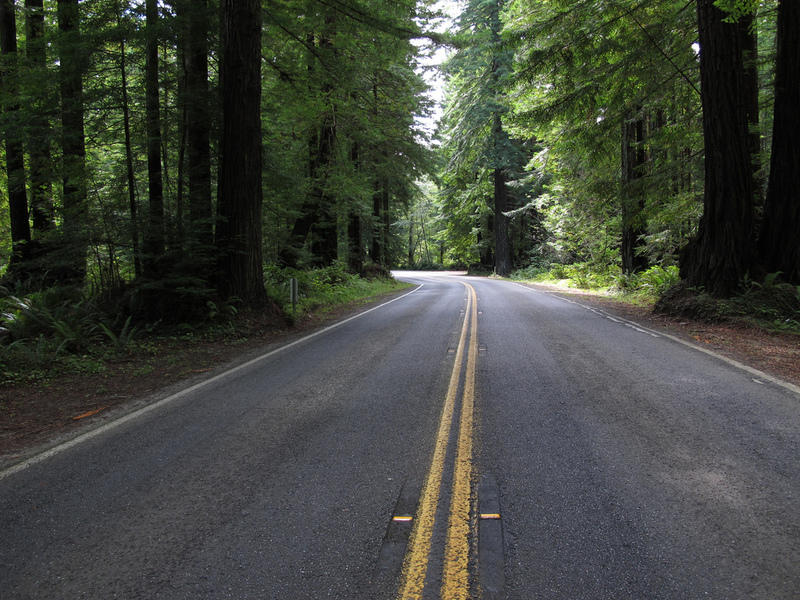 Humboldt County is doing a fair amount of work along Alderpoint Road. There were several awesomely paved sections as well as a lot of dirt sections. The dirt sections weren’t all that difficult, but there was likely 10 or so at about 1/4 to 1/2 mile each. The averave pavment was pretty good though. 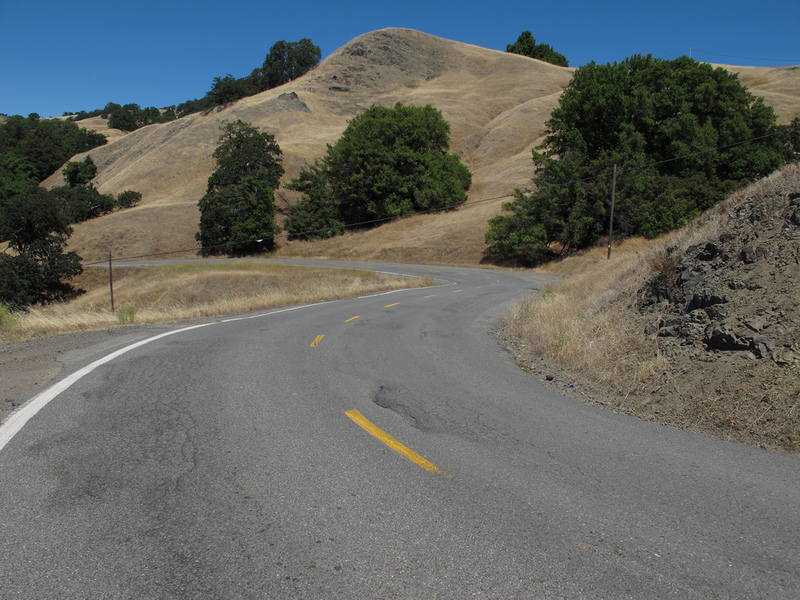 About halfway through the trip on Alderpoint, the road moves from tight twisty stuff to crossing over large mountain passes. I enjoyed the second half better exempting the dirt sections as the practice there is always great. The coast looked cold as the fog was coming over the mountains. 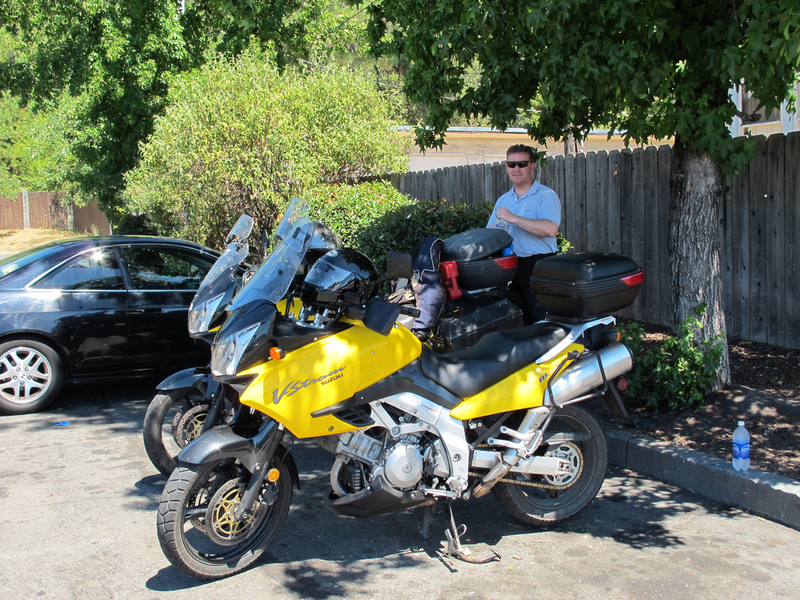 Upon arriving in Laytonville I saw another yellow V-Strom. I’d only seen one other yellow V-Strom since buying the bike in 2003 as that is the only year they made the yellow 1000cc model. This weekend I see two. His bike is having some issues but after flushing out the obvious stuff he chocks it up to bad gas further north. I wanted to try Branscomb Road as that was a new highway for me. Typically the roads are great on the eastern slope of the coastal mountains and then get progressively worse as you move west. Branscomb Road follows that pattern, but this little ditty is AWESEOME. The eastern side’s pavement is like glass and the western side of the road is in great repair. The western side had no double yellow, but plenty of pavement. 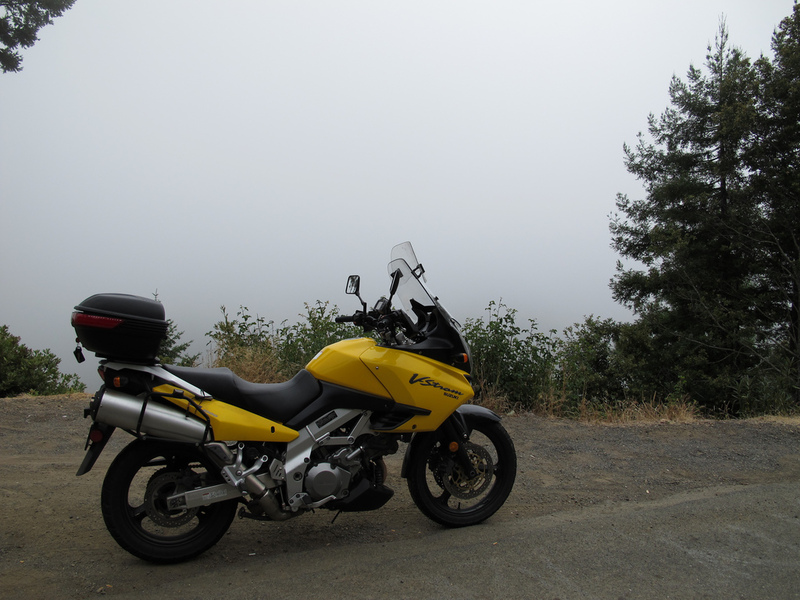 Once summiting the pass the fog came out in full force! All I could see out of the view to the ocean was a big white wall. The ride down the pass and into Westport was and easy one as the ride was short and the roads were good. 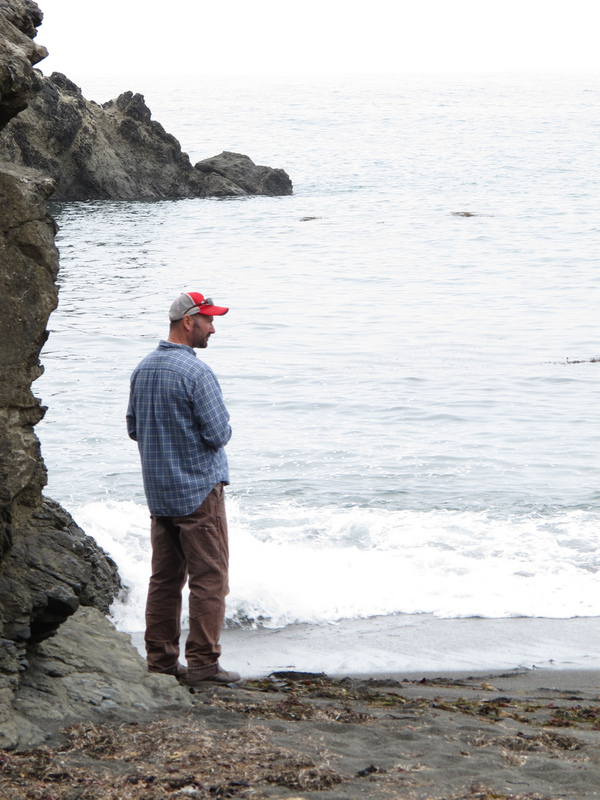 Kyle is the innkeeper at the Westport Whale. It was cool. I got a nice tour of the town of Westport as well as the cabin. The cabin sits right on the water for great views of the ocean and it’s an easy walk down to the beach. The stairwell down is L O N G! The beach was completely empty which was awesome. He’s got a great dog with lots of personality to boot! She loves to be out at the beach, but won’t be included at the cabin if you stay for a night! 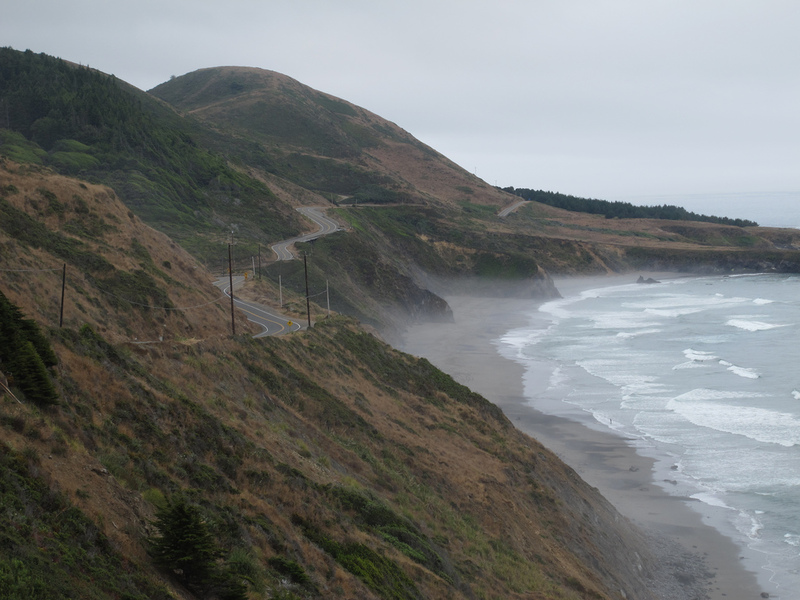 I’d ridden Highway 20 many years ago with a buddy of mine when we rode out to Mendocino. I’d gotten accustomed to taking 1 to 128 as it resulted less of the 101. What’s great about 20 is that it’s got tons of turnouts. The highway 20 pass isn’t super scenic, but the fog made for an interesting view. I started heading south on US 101 and fell into a great batch of cars that were running at a very good clip back to San Francisco. About an hour into the ride the sun was just about set. I had a long ride ahead of me in the dark and it was unseasonably cold for this time of year. I didn’t pack all that well either. By the time I got to San Francisco I was chilled to the bone. I only had my ‘stich, a T-Shirt, and athletic pants. A quick stopover to warm up for about 45 mins in the city and it’s back to heading south. Heading south things start to get warmer the further south of highway 92 I go. I get home shortly after midnight: tired, cold, and happy. Moral of this story? Spend more time packing. Regardless, enjoy the ride! Nice post! Making me really want to get a bike again. Next time you pass through Santa Rosa, look me up! Been awhile.